As iconic as the Coca-Cola logo is, after my #5by20 experience in Atlanta earlier this year, I see these words and feel warmth in my heart. Sometimes companies just get it. They understand that they can provide one opportunity that can trigger so many positive outcomes and affect so many lives. No matter how big the company is, no matter what product they sell. 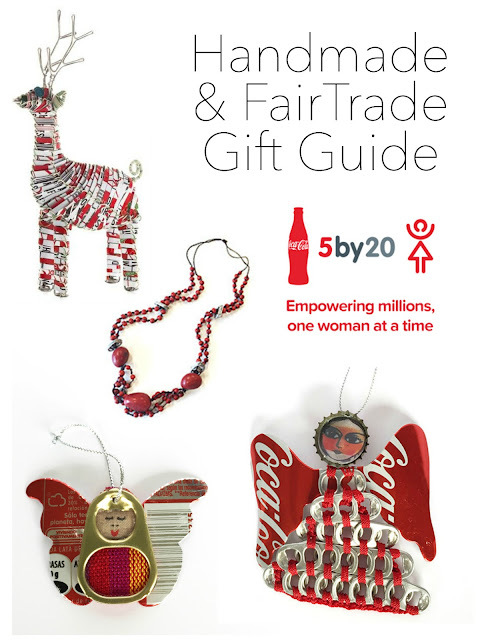 Coca-Cola knows that by helping one woman, that gift trickles down to her children, her family and her community. 5by20 is The Coca-Cola Company's global commitment to economically empower5 million women entrepreneurs across the company's value chain by 2020. Not only is the company giving reusable materials to the artisans and selling their items across a global market, the initiative offers women access to business skills training courses, financial services, and mentor connections. From jewelry to bags to home decor, you can give meaningful gifts this holiday season by shopping the 5by20 crafts & products online! Every 5by20™ item sold carries a profound gratitude from the artisans, as the income they receive helps support their families and strengthen their communities. Coca-Cola does not profit from these purchases. My favorite is the Upavim Ring Pull Ornament made from recycled aluminum cans by women in Guatemala. This year, these beauties are hanging on my tree!